This title presents traditional food and cooking in 25 authentic dishes. 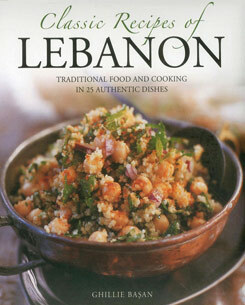 You can explore the rich and vibrant food of the Lebanon, one of the most exquisite cuisines of the world. It includes traditional dishes such as Falafel, Fattoush and Kibbeh, as well as less well known, but equally delicious, recipes such as Stuffed Apricots with Rice, Baked Red Cabbage with Quince, Roasted Fish with Orange and Lime, plus delectable desserts such as sweet turmeric cakes. The introduction offers a fascinating overview of Lebanese cooking and eating traditions plus a guide to the main ingredients of the country. This classic recipe collection includes a fabulous array of mezes, hot and sizzling main courses, a rich variety of vegetable dishes, and tempting sweetmeats and desserts. Nutritional information for every recipe is given. It is illustrated with wonderful photographs of practical steps and final dishes. Lebanon is world-renowned for its exotic and complex cuisine. The culture is ancient, absorbing influences throughout its history of invasion and foreign rule, all of which have contributed to a cuisine rich in variety and taste. This beautiful little book aims to capture the essence of Lebanese food and introduce the reader to a world of succulently roasted fish and meat, vibrant vegetables and salads, and irresistible desserts and sweets. It is the perfect introduction to anyone wishing to experience classic Middle Eastern cooking at its best.